order that we might write you concerning the matter. rendered themselves jointly liable "ith yourself. additional interchange of letters before the day of trial. Tour favor- of the 9th inst. received this morning. tions looking to an adjustment of the matters in controversy..
have '3veral strong lines of defense to the present suit, which t -'? may not be able to ove-comi. what *ou did receive, and the damage which resulted therefrom. 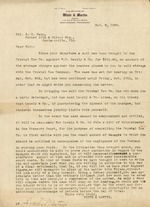 CITTANOO.A, TENN.Essr.a Oct. 21, 1908.
and setting up in detail your claim for damages. 24, 1908, hereinbefore referred to. Ice Co. has brought. That suit is brought against W.H.Lesaly & Co.
take will be to file a bill in the Chancery Court, as hereinbefore stated. we wish the names of the co-partners and their places of residence. GCO W.-T a e M...s.
names of the real parties in interest. cure the proper written authority and send' it alofg with your letter. sult of the improper storage of the peaches. ter, if your rights are to be properly pr otected. interested in the peaches. Kindly let us hear from you by return mail. and a certain tax paid, which is prescribed b,' statute. tion has been domesticated in this state since that ",ar or not. the charter and pa.Ting the tax, as above described. laws is going to be a ver." serious '.iestion in the pr.ese nt litigation. for the purpose of maintaining your la sal rights. Tennessee 'vithou' first having complied with the state laws. and paid the corporation tax.